High precision control valves for vacuum steam, with pressure reducing valve as their base (integral separator & trap). 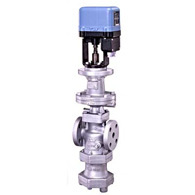 Can be used in a variety of steam-heating equipment that supplies steam at temperatures of 100 ºC or less. Concentration kettles, reactor kettles, heat exchangers, presses, dryers, etc.